Hello again! We are now six weeks into the school year, and student teaching seems to be keeping me even busier with each week that goes by – particularly as I continue to take on more responsibilities and roles in the classroom. As of this week, I will be starting to be the lead teacher in all of our math classes. Over the past few weeks, I have been encouraging students to come in before or after school to work on math assignments if they struggled with finding time to work on the assignments at home or if they felt they needed extra help on anything. Although some mornings end up with almost a dozen students coming in to work, I have four or five students who routinely show up a half hour before school starts to work on their math assignments or on their algebra packets, which they have a month to complete. I have been excited to see how willing the students are to take ownership of their learning by making time to come to the math classroom to work. Recently, the school partnered with an organization in the community that helped put garden beds into the schoolyard. Each class got to take a turn outside to contribute to the gardens, either by pouring soil into the beds or by planting seeds of plants that will be able to grow in the remaining weeks before winter. While the students will get to spend time in the gardens during their science classes, they got to develop a stronger sense of ownership of the gardens by contributing to the process of putting them together. 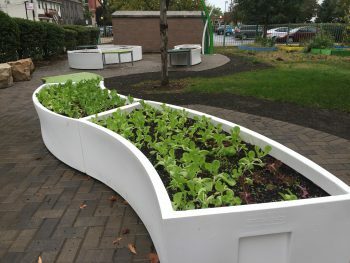 The new garden beds also have benches to encourage students to spend time in the garden outside of required activities through the science classes. In my seventh grade math class, the students had been working on adding and subtracting integers; however, the models we had been using in class to help students develop both conceptual and procedural understanding of the topic were not helping all students to further their learning of the subject. On my first day as the lead teacher in the class, I had to come up with new ways of exposing students to the material in order to help everyone gain a stronger understanding of this foundational material. After researching online and studying the models we had already used from the textbook, I found two new representations of the material: creating an image with balloons and weights tied to a basket to pull it up or down from its starting position, and drawing plus and minus signs to represent the integers being added together, which would allow any pairs of plus and minus signs to cancel out. As I was teaching the lesson, many students finally had their “Ah-ha!” moments and successfully demonstrated understanding of the material. I think one of the greatest challenges I will have as a math teacher is finding new ways to represent material to help all students gain conceptual and procedural understanding of the content, and this experience gave me a taste of what it’s like to do so successfully. In my time outside of student teaching and lesson planning, I have tried to explore the city and experience some of the cultural events in the Pilsen neighborhood. 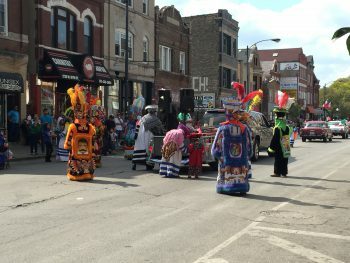 Pilsen is a primarily Hispanic community, and a few weeks ago, the neighborhood organized a parade in celebration of Mexican Independence Day. The students at Walsh were excited about the celebration and about getting to have an “out of uniform” day at school the day before the parade. It was amazing to see the community come alive with music, dancing, and clothing authentic to many individuals’ Mexican heritage. I also had the opportunity to visit the American Writer’s Museum downtown and attend a talk by Marie Benedict, author of The Other Einstein. The author explored the potential role Einstein’s first wife may have played in the development of his theories, and it was interesting to learn about this piece of science and history about which I had previously been unaware. The museum invites authors to discuss their writing almost every week, and I hope to attend more of these events throughout the semester. I also was able to attend the production of Thornton Wilder’s Our Town at the Redtwist Theatre. In eighth grade, I read the play in my American history class, so I had been curious to see the play performed when I saw it on the list of Chicago Semester art events. Having read the play before, despite the many years that had passed since then, enhanced my appreciation for it; however, even for those who had not read the play prior to seeing it performed, it was a wonderful experience, particularly due to the intimacy of the small theatre and the talent of the performers. I hope to have many new adventures to share with you in the upcoming weeks!